I could probably exhaust a month’s worth of entries over these memories, but I’ll select just a few and write of them today. Take this elderly gentleman in our neighborhood, who was mentally sharp even though in his eighties, and he loved meeting people. He could remember everyone’s name and face and life history and hold interesting (well, almost) conversations with people. He would drop in to meet my mother sometimes. For some reason, it bugged him to see that she was not socializing with people, and stayed in the apartment all the time. He suggested that I should take her for a walk in the corridor every day. Walks in the corridor were something I had discontinued a while ago. One reason was that my mother had become so unsteady (she also has ataxia) that it would be a task supporting her and navigating all those potted plants and boxes and stringy rugs and people in the corridor. There was another reason, which I did not want to tell an outsider about–that was her incontinence which made “accidents” of an embarrassing type possible in the corridor; I did not want neighbors to see me or the attendant wiping the corridor free of the consequence of such “accidents”. I saw no reason to explain this to someone else; it seemed like an invasion of her privacy to tell people of this. There was also this point that my mother didn’t really enjoy meeting people. She’d always been an introvert. In general, a dementia patient finds coping with new faces and situations difficult; I suspect it is like an exam for them. This is not always obvious to outsiders because patients retain their social skills enough to know what behavior is socially accepted, and most of the time manage to act within those parameters. But it is a real strain on them to “act normal” and they feel bombarded. To a patient who has, even otherwise, been an introvert, social interactions can get really tiring. Anyway, so back to my mother. As someone who was an introvert, her s threshold at which social interactions remained stress-free was low even earlier; after her dementia, it became abysmal. Obviously, she needed exercise and fresh air. We had solved her problem of variety and need for exercise by clearing out a long section in the apartment for her “walk”. Incontinence accidents here did not matter, as they could be handled without any loss of dignity for her. For her need for seeing people, we would seat her in the balcony every day so that she could see the childens’ park and the walkway around the housing society; she was happy enough with this. This neighborhood gentleman had his own opinion on what was right, and he felt his age and position in society gave him the right to be emphatic about it to us. Now, thinking back, I find the behavior of this insistent gentleman rather rude. It was okay for him to suggest, but what he did after that was keep insisting on the suggestion, and expecting that I was obliged to justify my actions. The reason I am writing about it now is, I realize that many people assume that family/ caregivers are obliged to give complete and satisfactory answers to explain why they are not behaving the way these outsiders believe they “should”. Perhaps the reason a caregiver/ family member is not explaining things to your satisfaction is because of a sense of privacy. Why should I tell an outsider that I cannot take my mother out in the corridor because she dribbled urine? Why must I then also justify why I cannot put her in a diaper (reason was: she found diapers uncomfortable and ripped off the diaper and chucked it across the room)? Why should an outsider assume that I am being lazy because I don’t give him a reason he finds satisfactory enough? Why should he accuse me of being mean and troubling my mother and not doing enough? So this gentleman was dissatisfied with my explanation. He then began insisting that I buy a wheelchair and take my mother in the corridor every evening in it, and when I didn’t, went around telling people I was neglecting my mother. He would even lecture my mother (on his monthly visits to her) that she should meet more people and walk more and stuff like that. And here’s the nub of things; people assume that others like what they like, and dislike what they dislike. Most of us, if we like icecream, expect others to like it, too. If we like meeting people, we can’t imagine why anyone would spend hours alone, reading a book. That a dementia patient’s needs and likes may be different because of the medical condition is not understood by others who assume the patient must be liking whatever most old people like, and disliking whatever most old people dislike. By not knowing how dementia affects a person, outsiders end up making erroneous assumptions about the patient and family, and acting on it. Another incident comes to mind. My mother used to wander off. Her room had a door that opened directly into the corridor, and whenever she heard some voice, or footsteps, she would get up, lurch towards the door, open it, and wobble out (her gait was very wobbly because of her ataxia). Then, she would walk aimlessly, forgetting why she’d come out. A few times, I’d spotted her at the head of the stairs, about to walk down; she would have broken a few bones, given her gait. I brought her back, and told everyone I knew to bring her back if they saw her outside. I also told her there was no need to go out when someone passed by in the corridor, but she couldn’t understand what I was saying. Mother’s wandering worsened to a point where we disconnected the bell when we were not in the house, so that the doorbell didn’t disorient her into walking out. Then, when that was not enough, I placed a lock inside her door, so that she could only go out using the other door (she would be passing my room on the way, and I’d have noticed her). This door-locking caused a major problem, as she started saying she was imprisoned. I pointed out that the main entrance was still open. She complained to others. People who visited her also had to come through the other entrance, and they started scolding me for being cruel to her. I explained to them that she wandered and with her balance problems, she could fall, but it was the same logic all over: “We would not like being locked up like you lock up your mother.” I was subjected to long lectures on cruel children and how we should be grateful to parents who nurtured us and stuff like that. There was this gentleman who didn’t contend himself scolding me or spreading bad vibes about me in the housing society. He extolled my mother to protest, saying how do you put up with such cruelty. Told her she was an educated woman and should fight me. She was already agitated by the lock; his exhortations would further agitate her and after he left she would rage and rant against me for hours. She was already delusional at times, and paranoid about many things, and this added to her unhappiness, and ours. It was very difficult to continue keeping the door locked in face of such outright criticism and accusations, but I had no other way of stopping my mother from wandering, given that we were in an apartment where her room allowed her direct access to the corridor. We could not change the apartment at that time, not could I make her change her room; she had been in that room for 16 years. I was only able to stop it later when I managed to find a maid who would be with her all day long, and was reliable enough. I have known families where patients wandered off and were found hours later, in a terrible condition. Which is why we need awareness of dementia, so that people can understand that family members sometimes need to protect a person who has lost the ability to keep herself safe. Wandering is a well-known problem in dementia, and if people understood dementia and accepted it, they would be supportive of families trying to keep the patients well and safe. Another incident bubbles in my mind. There was this old, very religious, lady in our neighborhood who would drop by to see “Bimla Behan”, as she called my mother. 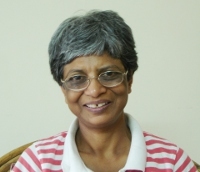 This lady was the sort who conducted classes on spiritual topics and considered herself a real expert on how people should think and act and such things. My mother had reached a stage when she could not read. Though her eyes were okay (cataract operations done in time, eye pressures okay, eye checkups up-to-date, spectacles correct), she could not interpret words or remember what she’d just read. In effect, though she had enough “visual potential” (as the doctor confirmed), she could not read even a few sentences. This religious neighborhood lady would tell my mother to read spiritual texts. My mother (a masters in Philosophy, and a widely-read woman) would shake her head and say she could no longer read. The shelf near her was full of books that were too dense for her to even attempt reading now–commentaries on various texts, Pail Brunton travel books, Ramanna Maharishi, J Krishnamurthu. This lady would say, “aap padhti kyon nahin? bore nahin hoti kya? (why don’t you read, don’t you get bored without it?) Then she would turn to me and tell me to make my mother read. I took her aside a few times and explained to her why my mother could not read, but she–I can’t think of any other way to describe it–refused to understand. My mother cried late into that night. I did not know what to do. In our culture, there is a limit to what we can say to people much older than us, and we are sort of obliged to listen to their rants and scoldings however misinformed they are, and howsoever unfair. But this was downright meanness, and short of not allowing the lady to step into the apartment, what could I do? She absolutely refused to understand. And she would come every day to reform my mother and I. This lady had a daughter, and she was very proud of this daughter. She also liked to pretend that her daughter was a very docile and considerate person, and lost no occasion to boast about this. Sometimes, on days when the lady had just had a disagreement with her daughter, she would be even more vocal and emphatic about how good a mother she was and how obedient the daughter was. Again, I tried to explain to this lady what the problem was. My mother’s lack of physical coordination was obvious, even if someone was willing to ignore the confusion and other memory problems. This lady scolded me, then went back and told my mother that she lacked willpower. The lady was always critical of my mother. Once, my mother starting talking of her earlier life, and got some rather salient facts wrong. Like thinking her grandson was her son. And saying her brother was still alive. Stuff that didn’t materially hurt anyone even if misremembered. This lady pounced on her to point out the mistakes, and insisting that she “correct” her memory. My mother got upset, and this lady wouldn’t let go. It hurts me even now to remember how my mother would cry after every trip of this lady. Why does she talk to me like this, she would ask me. Yet, my mother would also look forward to this lady’s visits, in a way I still find strange. She did not want me to stop the lady from coming, and if the lady did not drop by, my mother would get really agitated and insist that I find out why she hadn’t come. Maybe at some level my mother agreed with all that criticism, because she also wanted to believe that her problem could be solved, and what easier way of solving than blame a daughter? When ,my mother’s mood would swing in a way where she believed the lady, my mother would get very upset with me for “setting rules” and being cruel. She even blamed me for her bad memory. I had to finally act unpleasant to the lady and many others who continued to egg my mother into moods of utter hopelessness or rage. I asked them to stop coming. It was the only way to stop their visits, which were like a daily torture dose. It was sad, because my mother was still capable of connecting with people if they would reduce their expectations and take her constraints and different reality into account. But these daily scoldings were traumatic. When I asked the lady to stop coming, the lady exploded one me and cursed me, my mother cursed me, and everyone acted like I was being mean. But a few weeks later, things were far calmer in our home. My mother’s agitation reduced, and she was more willing to accept help in activities where her lack of coordination was a severe problem. After some weeks, when we saw that lady walking past, my mother turned to me and said, “I hope she won’t come here. She was always saying I am not working hard enough. Why did she talk to me like that?” My mother’s face was stiff with tension, and I assured her that she wouldn’t have to interact with that lady any more. The sad part is, these were good, solid people, respected by others. I am sure they considered themselves to be honest and considerate people. I am sure they did not intend to hurt or taunt or make things difficult for someone already suffering, and the family around that person.